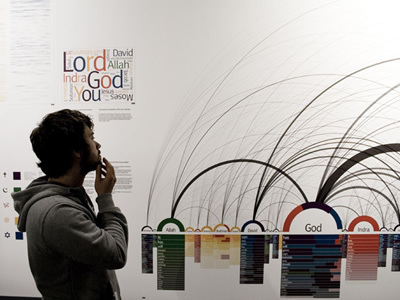 Made with Processing and VVVV, Similar Diversity is an information graphic which opens up a new perspective on the topics of religion and faith by visualizing the Holy Books of five world religions. 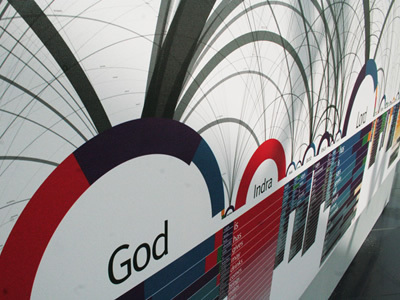 Communalities and differences of Christianity, Islam, Hinduism, Buddhism and Judaism are shown in this visualization. The graphic's basis is an objective text analysis of the Holy Scriptures, and works without any interpretations from the creators' side. Despite - or even because of this abstraction, the artworks are not only working on an informal but also on an emotional level. The viewers should be inspired to think about own prejudices and current religious conflicts. Similar Diversity was exhibited at the Hangar-7, Salzburg, on June 2007.